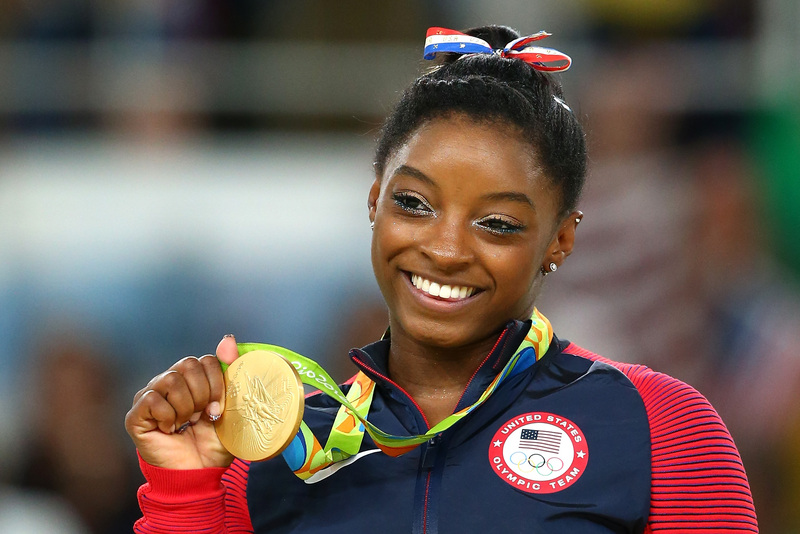 No one is having a better time in Rio than Simone Biles. The 19-year-old gymnast, who won four gold medals and one bronze at the Olympic Games in Rio, is unequivocally the best gymnast in the world. But even though Biles went through weeks of grueling competition, insane pressure, and literally the entire world watching, she and the other women in the Final Five had a great time in Rio. Biles is just as good at having fun as she is flipping and flying to unbelievable heights on the floor. If you haven't been following Biles' journey on Instagram, you've missed some magical moments, including, of course, when she met her longtime celebrity crush Zac Efron, who kissed her on the cheek and made her swoon. Biles and her fellow gymnasts are a tight bunch, and they held each other up through the heat of the games. No matter what Biles does, she makes it look easy as pie, from her physics-defying flips to her ability to breeze through the games like she's just there to watch. Here are some of Biles' best Instagrams from the 2016 Rio Olympics, because she should also get a gold medal in having a blast. Hanging With Her "Brazilian Boyfriend"
Efron has competition in the fight for Biles' heart. Biles formed a fast friendship with Arthur Mariano, a gymnast from Brazil that won the bronze medal in the men's floor exercise. He's ready to fight for her too: Mariano re-grammed this photo with the caption, "I saw her first." All in jest, of course. As if anyone could get on their level. What better way to celebrate being the most decorated American gymnast of all time than with some french fries and chocolate ice cream? The two gymnasts became close friends in Rio, and though they're from different countries, they have at least one thing in common: They're both among the best gymnasts in the world. So great to see them celebrating their victories together. The moment that Efron walked in to surprise the Final Five was too cute. Biles has a life-size cutout of Zefron in her bedroom at home, so she was obviously over the moon when he showed up in Rio — he had become a huge fan of the Final Five himself. And the cheek kisses sent Miss Simone over the moon. Laurie Hernandez was another breakout star from the Final Five. The youngest on the team at only 16, she was extremely impressive on the beam, earning a silver medal. It's so great to see Biles as a friend and mentor to her talented teammate, and they are such small babies in that throwback! Biles' story and the love and support from her parents has become such an uplifting one throughout the Olympics (I died each time they kissed after she completed a routine). But not only did her mom and dad come to Rio to support her, she had a whole entourage of family fly down to Rio to cheer her on! Front and center was Simone's sister, Adria, who's also her best friend. "We'll stick to gymnastics" is code for "We're about to dominate and shut down the competition." With smiles, of course. No big deal. Just a bunch of beautiful women, who happen to be unbeatable. Apparently the short-sleeved leotards are casual wear. Biles made history at the 2016 Olympic Games, and she had a ton of fun doing it. She's the all-around champion of being the best.